The book launch in Kyiv was attended by almost all the conference organizers and speakers from Italy: Giorgio Cracco, general secretary of the Institute of Social and Religious History of Vicenza, Francesca Gori, Soviet history specialist at the Unidea Foundation, Andrea Graziosi, history professor at the University of Naples, Francesca Lomastro, research fellow at the Institute for Social and Religious History of Vicenza, along with Italy’s Ambassador to Ukraine Fabio Fabbri and director of the Italian Culture Institute in Ukraine Nicola Franco Balloni. The Ukrainian participants of the Vicenza conference represented Ukraine: the historians Yury Shapoval and Stanislav Kulchytsky, Ukrainian parliamentary advisor for international issues Yuriy Shcherbak, National University of Kyiv-Mohyla Academy president Vyacheslav Briukhovetsky, Kyiv Mohyla Academy professor Yuriy Mytsyk, and others. Addressing the audience, Andrea Graziosi cited the horrible statistics of the Ukrainian Holodomor, which the Italians had obtained in the 1930s. Prof. Graziosi is the author of Letters from Kharkiv, a book based on reports sent by Italian diplomats in the Soviet Union to their government. 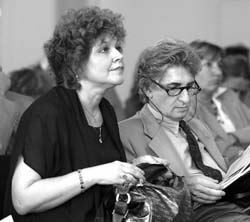 Proposals to translate and publish Graziosi’s book in Ukrainian were discussed. Both the Ukrainian and foreign speakers often mentioned the American-born James Mace, who revealed to the world the horrible truth about the famine in Ukraine. They recalled his work as staff director of the US Commission on the Ukraine Famine, his tenure at Kyiv-Mohyla Academy, and his memorable speech at the conference in Vicenza. Days before the book launch in Kyiv, The Day published a bilingual Ukrainian-English book, Day and Eternity of James Mace, a compilation of some of the late Dr. Mace’s best materials along with reminiscences by people who knew him, including Kateryna Yushchenko, Vyacheslav Briukhovetsky, Stanislav Kulchytsky, Yury Shapoval, and many others. 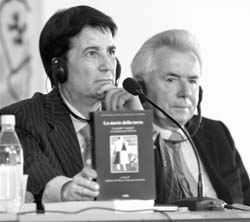 “When Ukraine tried to raise the issue of recognizing the Holodomor as an act of genocide, we found active support in Italy, in no small degree owing to the extensive research and educational efforts undertaken by Italian scholars,” says The Day’s chief editor Larysa Ivshyna, adding, “The book contains materials that were published in our newspaper. 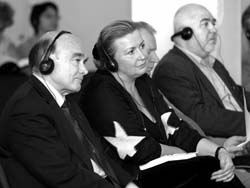 In particular, in his October 21, 2003, article entitled ‘Intellectual Europe on Ukrainian Genocide,’ James Mace wrote about the conference in Vicenza. I would like to present this book to the Italian scholars and thank them for their efforts.” In return, the director of the Italian Culture Institute in Ukraine, Nicola Franco Balloni presented Larysa Ivshyna with the book, Death of the Land. The Holodomor in Ukraine of 1932-33. “I am very pleased that you joined our presentation. These two books have a common subject. After all, securing the international community’s recognition of the 1932-33 Holodomor in Ukraine as an act of genocide against the Ukrainian people was the lifework of James Mace,” Balloni said. After the international conference in Vicenza, the Institute of Social and Religious History of Vicenza has continued to focus on the histories of Central and Eastern European nations, especially Ukraine. According to Prof. Graziosi, on October 12 Rome will host a seminar on the Ukrainian Holodomor, to which leading Ukrainian scholars have been invited.